As a hand approaches the main screen, the display awakens to show more commands. It’s quite charming, and the cool factor never ceases to impress occupants who have never seen CUE in action before. The same goes for the clever storage space behind the unit, opened by tapping the bottom lip of the center stack. And while we have no complaints about the background, the icons look like they fell out of 1998. Touching one yields an acknowledging vibration, and a dull thud, followed by the processing of the command. Every action, from using the navigation, to XM Satellite Radio, features this feedback from the system. Pressing and holding one of the icons activates a drag-and-drop function, similar to how one can rearrange the icons on their smart phone or tablet. All of it is very familiar, and CUE is also capable of receiving software updates. Unfortunately, the biggest issues currently plaguing the system all have to do with the speed with which the system responds to inputs, as every action feels slow or delayed compared to competitive units, such as BMW iDrive or Audi’s MMI. In-vehicle WiFi is also currently missing in action. Probably CUE’s best feature is the new navigation system. Unlike GM navigation systems of the past, users no longer have to input the city, state, or province before getting to the street and street number. Now, it’s simply type in the address (or whatever information you might have), and go. The navigation information can also be relayed to the instrument panel, and navigation commands can be voice-activated if desired. Even more intuitive is the ability to add addresses to the list of favorite presets, the same way you would otherwise set up a favorite radio station. And with space for sixty presets, it’s difficult to run out of room. The presets are stored at the bottom of the screen, and can sometimes go into hiding. If this happens, simply place a finger at the bottom of the screen, and swipe upwards. Adjusting the volume is pretty cool, at first. Instead of using a conventional knob, I simply placed my finger on the indicator, and dragged it horizontally until I found the preferred level. Unfortunately, this takes a few tries, as the feature tends to over-adjust constantly. Thankfully there’s an easier-to-use steering wheel control button for this. The same can be said for the tuning function, which also requires a dragging action, and also over-shoots. The HD radio system was also mildly confusing, having as much as three different frequencies of the same FM radio station on display. And while the setup doesn’t relay static, the sound tends uncontrollably hush itself in the event of a weak frequency, and comes in delayed for a split second, giving a brief echo effect. Thankfully, Bluetooth usage is easy from step one. I paired my phone (iPhone 4S with iOS6) to each Cadillac in a matter of seconds by using the “pair” voice command, and then syncing the systems up with a single touch on my phone. Gravy. And like radio and navigation presets, contacts can also be inserted into the tab of favorites. But it was with our Cadillac ATS tester that I discovered something puzzling and frustrating. The car wouldn’t dial the phone numbers I commanded it to. CUE would say it was calling my friend, we’ll call him Johnny, but nothing would dial. And I tried cancelling the call, both on my phone and on the center stack, and the car seemingly refused to obey, continuing to tell me it was calling Johnny via the driver information center display below the speedometer. Considering this happened only once, we’ll give it a pass, but we won’t be surprised if we experience this again in another Cadillac. Similar bugs presented themselves when attempting to stream Pandora radio from the phone via a USB cable. On a side note, Bluetooth audio would also work, but I like to charge my phone while I drive. Now, a good handful of times I was left to troubleshoot the “Pandora Error” readout on the screen, which was usually the result of a bad synchronization between my iPhone and CUE. I would sometimes have to unplug my phone from its cord (inserted into one of the USB ports) and then plug it back in again. Vexing, to be sure. Judging by the CUE’s female (?) voice, you’d think that it was Siri from Apple, and therefore, the operating system must be Apple’s. It’s not. Nor is it Windows, or Android. It is, instead, based on Linux. We haven’t seen the immediate benefits or detriments of using Linux as the foundation, but if you’ve been paying attention, you know that CUE will soon offer app functionality. As far as hardware goes, CUE runs on a 3-core ARM 11 processor unit, which is not fully utilized just yet in order to leave room for growth, and the eventual addition of more functionality. 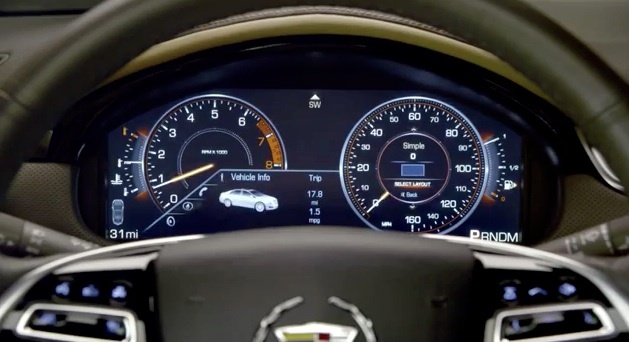 Aside from the response times and connectivity bugs, how does it feel to operate the tablet-esque CUE infotainment system currently found in either the Cadillac ATS, SRX or XTS? Well, even after a combined three weeks with the system, it was difficult to get used to. I believe that’s due to the touchscreen’s lack of tactile controls, making it nearly impossible to remember the layout, compared to one that features a set of buttons and knobs. Perhaps there is a scientific study on this. If not, there definitely should be. An easy comparison that may help describe things is when I upgraded from a conventional “dumb” phone, to an iPhone. With an easy-to-memorize keyboard with buttons, I could send text messages and such without even looking at the phone. There quickly became a sense of muscle memory there. With the iPhone, I have to look, even after a year of owning one. Because — like CUE — everything is conducted on the same, flat surface, and it’s difficult to know what’s being pressed or displayed without glancing at the little screen. Or how about when we all first learned how to slowly type on a keyboard, eventually proceeding to be able to type essays without so much as glancing at the letters we were pressing? Can you imagine if your computer’s keyboard suddenly became a giant touch pad right now? It sure would look awesome, but would you be able to produce a sentence as efficiently without a tactile set of “home row” keys? Most of you will probably go with “no”. All things aside, there is a major philosophical issue with CUE’s design: we all know that smart phones and tablets shouldn’t be used when driving (unless they’re being operated via voice commands), so why on earth would anybody want to model a center stack layout after such devices? It’s not something we really think about in a stationary position, curled up on a couch, fiddling with apps on an iPad, while it fully commands our attention. But try doing the same act, while operating a vehicle at speed. Sure there are voice commands, but they don’t always comprehend what the user is saying. A proper cadence must be voiced out for certain commands, and the process is more time-consuming than using analog adjustment, which is undesirable. It’s almost like we’re being punished for avoiding the touch screen. And if this freshly-turned 24-year-old — squarely in an age demographic that’s been categorized as adept to technology — is frustrated with the system, how in tarnation does Cadillac expect retirees in Florida to change the radio station in their Cadillac XTS without obliviously hopping onto a curb? But it’s not just Cadillac… it’s the industry as a whole, that’s introducing these fangled systems. 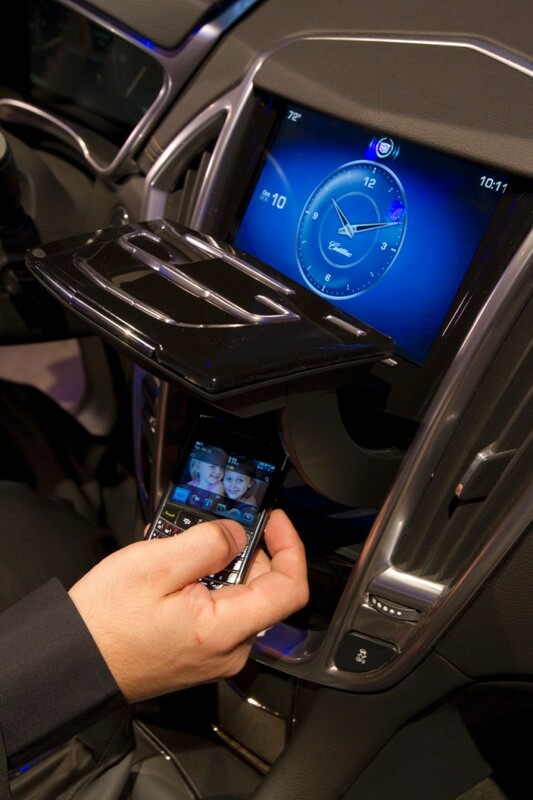 Advocates of elaborate infotainment systems like CUE like to claim that it’s simply the learning curve of new technology. To a point they might be right, but it may just as likely be that automakers still haven’t found the optimal user interface that pairs well with driving. One young man’s suggestion: integrate most of CUE’s center console functions into an intricate Heads Up Display, controlled by an ergonomically friendly set of buttons and knobs located where the hand rests by the shift knob (not unlike iDrive). In my twisted mind, I envision greater ease of use, while eyes remain upward, glancing at the road as well as the information. If HUD works for fighter pilots going mach 2, it should work for drivers going 55 mph. Despite the shortcomings of CUE, it hasn’t slowed down Cadillac one bit, with sales skyrocketing nearly 47 percent from a year ago in January. At the time of this writing, there are some significant upgrades on the way for CUE. 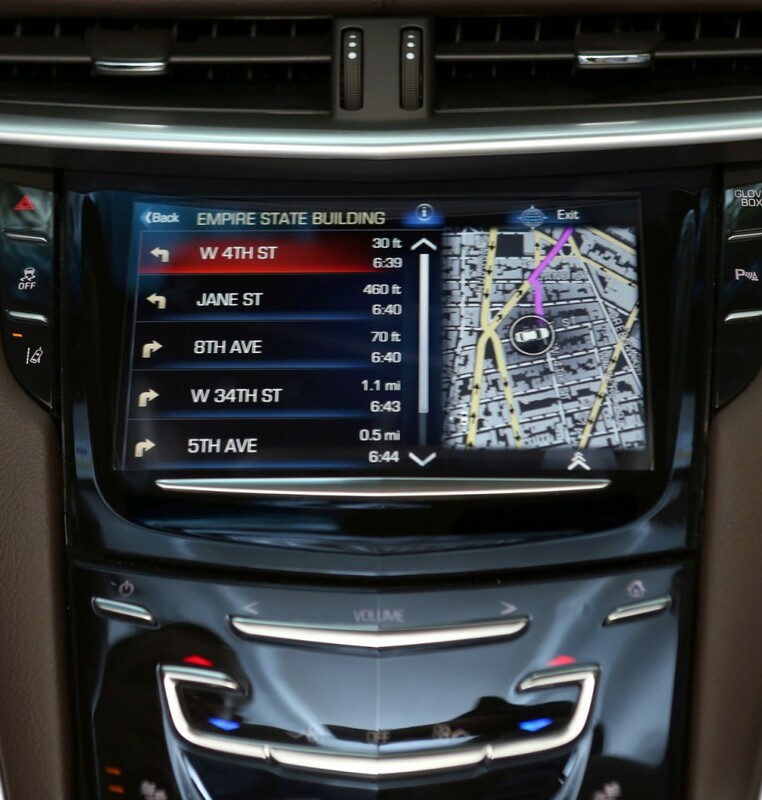 As we reported, Cadillac dealers will administer the update to compatible vehicles, consisting of the 2013 ATS, SRX and XTS models, with the update said to improve processing time, adding Siri Eyes-Free functionality, a greater contacts/address book synchronization threshold, and expanded USB media device compatibility. These enhancements are expected to lead to better ease of use, but we will still miss our knobs. Though we give kudos to Caddy for trying something different. Previous story Will GM Be Successful In Reaching Its 2015 Break-Even Target For Europe? FYI…You have to plug in an I-phone for Pandora use. Limitations of the iOS bluetooth stack (if my memory serves me right, Andrioid should work fine over bluetooth). For phone use, I believe you can only have one number per contact or it won’t be able to dial since right now. You can’t tell it via voice call to Johnny’s cell right now; might be a good experiment to conduct. Dam, no edit button. I meant to say an IPhone works best (for steaming) with a wired connection, but I could be wrong. Streaming should still work. I could definitely stream music from my iOS device via Bluetooth. And I only have one number for that contact in particular, while for others, I have several. Of which, I was able to call somebody with multiple numbers just fine. It seemed to be a random bug. Yay for WiFi! The heads ups display is one of the best and under utilized methods of displaying info. by its design it to convey critical information to a pilot. now driving a car at 55mph is not as serious as combat but the concept is the same GM should offer more information on their hud systems as an additional means of driver control..you have a whole windshield to display info on. might as well put it to intelligent and safe use. Andy is incorrect. You can use iPhone and A2DP to stream any source, Pandora included, to CUE. I meant to say that it will work, but for the best experience with an Iphone, it needs a wired connection. But I could be just mixing things up. GM needs to take a “cue” from the aerospace industry and utilize its heads up technology. Do you think that the US military knows a thing or two about integrating information and control? HUD and HOTAS (hands on throttle and stick) keeps the pilot’s eyes fixed outside the cockpit while offering all the pertinent info without having to fumble around for controls. Get with it GM lead the world with the technology that you pioneered. And forget the Apple/Mac tech that belongs in a office setting. I am sure the CUE will soon be retuned after all the complaints we hear of every day…many video reviews dwell on the poor quality of it…once it is updated, hopefully we will all be satisfied. My last ATS drive was the same…I could not figure out what I was doing while trying to watch the road and, this was the base radio system! yeah that what autoblog is for. Johnny Lieberman was right in his CUE review. The knobs that BMW and Mercedes use works best. You can get used to the number of clicks it takes to perform an action, keeping your eyes on the road. With CUE, you have to stare at the screen while you navigate. Cue “2.0” (not sure what else to call it – other than the Cue Update) speeds things up a bit. You will notice a couple icons, such as the climate, are changed. The lady’s voice is less “Siri” and more natural. She doesn’t sound like she smokes a pack a day and hasn’t gotten some in 5 years anymore. Navigation commands are also a little faster and responsive. When scrolling through radio stations in the browse menu, you will notice it for sure. I had also been having trouble with songs from my iPod matching up. This has been fixed. Cadillac is very committed to making sure that all Cue owners are updated. They will be $INCENTIVIZING$ customers to make a trip back to the service lane. Pretty cool program. If the CUE system becomes standard in all models, then I am currently driving my last Cadillac. Just went from a CTS to a new ATS. Took a few days to get used to., but it is pretty easy and I am not the most technical person. I like the sleek look and love the car. Knobs or touchscreen both work well for me, and I still think iDrive is the best infotainment system out there. Chrysler’s u connect system is pretty good too. But then again, I am a pretty technical-minded person. Learning to use the CUE system was too easy for me. I leased a 2013 Cadillac SRX with GM CUE system. My calls transfer from my iphone V to car speakers just fine. I have not downloaded iphone new IOS platform because I think it will screw this feature up. My problem is the voice navigation on my iphone will not play on neither my phone or thru car speakers when I’m in my car. it works fine when I’m not in the car. Also It works in in older model vehicles. Why does it not work on the CUE SYSTEM? I prefer to use my iphone navigation because GM CUE navigation is lousy and complicated to use. Had I known how difficult CUE would be to work. I would have opted out of that technology all together! My friends all own Ford SYNC TECHNOLGY and swear by it! They all say they would not go near GM VEHICLEs because Ford’s TECHNOLGY far surpasses GM. GM technical service team blames everything on APPLE’s technology! We are currently leasing 2 Cadillacs an SRX and a ’14 CTS. Great cars but my wife and I cannot tolerate the Cue system. The nav and audio are buggy and slow but the ridiculous capsitive touch controls are uncceptable. They always need more than a simple touch and all too frequently require taking your eyes off the road to see what and where your pressing. And correcting over runs. BMW, Ferrari, Benz, Jag, even Hundai and Chrystler all got it spot on with simple, positive action buttons and knobs. I have no idea what Caddilac is trying to prove with these controls but it’s back to BMW for us as soon as we can get out of these leases. We’ve had our 2014 Chevrolet Impala 2LTZ for about a week now, and my only complaint is the Navigation and Radio. We also have a 2014 Chrysler Town and Country with the Garmin system and it works like a snap. The GM system in the Impala must be the same as the Cadillac Cue system, and it is HORRIBLE! It can’t find anything after typing in an address, and the VOICE RECOGNITION SYSTEM IS WORSE. We have used On-Star to set up destinations, which is only ADEQUATE at best. As a GM stockholder I was impressed with the features on the new Chevrolet Impala, but after this experience I am not optimistic about the future of General Motors. I think I will sell my stock when I get back and trade in the Impala for a Ford Taurus SHO or a Chrysler 300C Luxury Series in 2016. I will drive the Town & Country for long trips and leave the Impala in the garage when I go on trips and use the Impala only around town where I am familiar with the area. The instruction manual does not tell one how to save addresses or contacts to favorites. This article says it’s intuitive….it’s NOT. I have an IPhone. I had an 09 CTS with navigation and added addresses to it, but I still have not figured out how to do it on my new 2014 CTS.